The PVI Multifold ramp has a patented No-Pinch Hinge design and is easy to handle and set up. The ramp can separate into two pieces for weight reduction and easy carrying. The Multi-fold ramp comes with a handle so that you can carry it like a suitcase. All aluminum construction, light weight and durable, surfaced with anti-slip, high traction safety tape. Designed for wheelchairs or scooters with three or four wheels. Weight capacity is 600 pounds for the 5, 6, 7 & 8 foot lengths and 500 pounds for the 10 & 12 foot lengths. 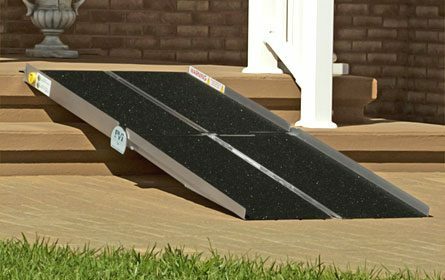 The Multifold ramp should be attached to your step with screws or bolts in order to keep the ramp from slipping off. The Multifold ramp also comes in a Bariatric Model, 36 inches wide with an 800 pound capacity in 5, 6, 7 & 8 foot lengths. If you need a ramp with handrails please see the Modular Ramp page or the Ontrac Ramp page. Ramps come with a Limited Lifetime Warranty and free shipping in the lower 48 states. 1:12 ADA slope for public access & walking elderly. 2:12 Maximum slope for residential use with assistant. 3:12 Maximum slope for loading unoccupied wheelchairs.